Carolina is an aspiring editor who joined our Words Alive Family as an intern in the summer of 2018. Her writing skills, experience working and communicating in an office, and familiarity with social media marketing made her a perfect candidate for our social media internship. Throughout her internship, Carolina helped create content and measure our visibility on all platforms. She volunteered outside of her role to support our events as well! Carolina volunteered at the VIP Reception for the 2018 Author’s Luncheon and Fundraiser. There she met and interacted with Words Alive supporters, helped with setup and organization, and saw the finished product of her marketing efforts over the summer. Carolina is a devoted and caring individual who fit in perfectly with our team! We have been so fortunate to have her positive attitude and skilled support over the past six months. Thank you, Carolina! Learn more about Carolina from the interview below! I grew up in San Diego all my life. Since I was very young I grew up loving books. Right now I’m a senior at San Diego State University, studying English and Publishing! I enjoy discovering new books and poems to read. Aside from that, I enjoy walking my dogs, hiking, and drinking lots of coffee! I aspire to be a creative editor for a publishing company one day! 2. How did you get involved with Words Alive? During the summer of 2018, I didn’t take any classes and was just working at my job as a receptionist. I wanted to do something meaningful and related to my future field. Luckily I found an ad for Words Alive online and I promptly applied. What first got me interested was Words Alive’s mission to advocate for children’s literacy education. As a lover of books, I can’t imagine my life without reading. I think what they are doing is incredible! 3. What is the most rewarding part of your volunteer role(s)? As a social media intern, I worked on creating content for various platforms. I absolutely loved my volunteer position and I learned a lot throughout my internship. The most rewarding part is probably knowing that the posts reached people and motivated them to volunteer! I also enjoyed writing the posts and seeing the impact Words Alive has in our community through the blog posts and even events like the Annual Author’s Luncheon and Fundraiser. 4. What are you reading lately? I love a variety of genres in books. From fiction, nonfiction, YA, and classic literature. Right now I am reading “Becoming” by Michelle Obama. 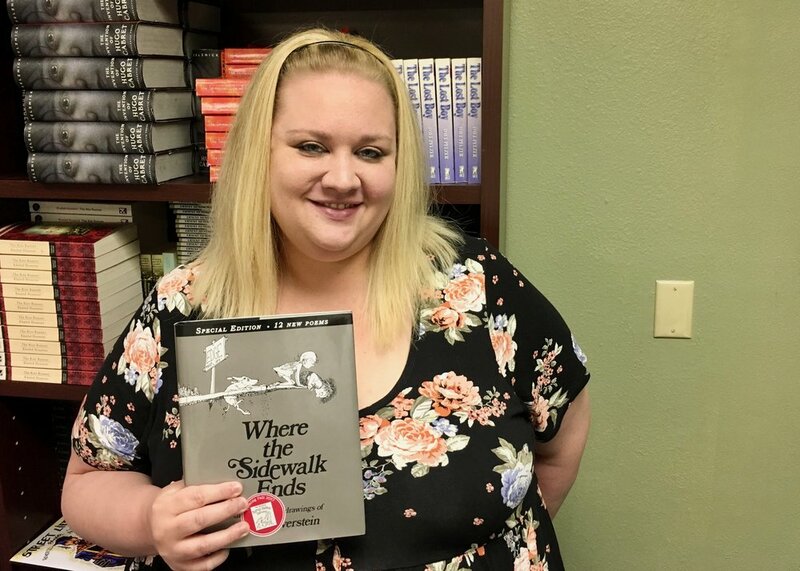 An image of Kristina Houck standing in front of bookshelves and holding up a copy of Where the Sidewalk Ends by Shel Silverstein. Kristina Houck came to Words Alive when we folded Rolling Readers into our portfolio of programs in 2014. She is an award-winning journalist and currently works as an editor for Patch, covering San Diego and Marin counties. She previously served as a staff reporter for U-T Community Press, a group of community newspapers in San Diego's North County. With a background in journalism and public relations, Kristina sits on Words Alive’s Board, serves as Board Secretary, and chairs the Communication & Marketing committee. She earned a bachelor’s degree in journalism and political science with minors in English and religious studies from San Diego State University. Kristina lives in the San Diego area with her husband, Jason, and son, Harrison. Let’s hear more from Kristina herself! When was the first moment you fell in love with reading? I developed a love of reading at an early age. From Dr. Seuss books as a young child, to "The Baby-Sitters Club" series as a preteen, I constantly had a book in my hand. How do you use literacy in your day-to-day life? As a writer and editor, literacy is crucial to my everyday success. I read and write for work. I also read and write for pleasure. Most importantly, I read to my 19-month-old son, Harrison. It has been an absolute joy watching him discover books and already develop a love of reading. Some of his favorite books include "The Very Hungry Caterpillar," "Where Is Baby's Belly Button?" and "Chicka Chicka Boom Boom," which was one of my favorites as a child. What inspired you to join the Words Alive board? I joined Words Alive by way of Rolling Readers, where I served as a board member and chaired the marketing committee. When Words Alive folded Rolling Readers into their programs in 2014, it was a natural fit for me to join the team. I whole-heartedly believe in the mission of the organization and have seen the impact of the Read Aloud, Adolescent Book Group, Family Literacy and Westreich Scholarship programs on the community. In addition to sitting on the board, I serve as Board Secretary and chair the Marketing & Communication Committee, which strives to share the amazing work we do with the greater public. As Marketing & Communication chair, I also spearhead our annual Share Your Love of Reading campaign, which invites San Diego's most prominent politicians, media personalities and other local celebrities to act as honorary readers in Words Alive classrooms. Students receive free books during the month-long campaign, which aims to raise awareness about the importance of literacy and reading aloud. What has been your favorite aspect of being a Words Alive board member? From working on the Share Your Love of Reading campaign, to visiting Words Alive classrooms and attending events, I've made so many memories and worked with amazing people while serving as a board member. It’s been truly rewarding to be a small part of an organization that has made such a big impact on the lives of children, teens and families in San Diego County. Thank you, Kristina, for all you’ve done for Words Alive! Learn more about our Board of Directors here! Please join us in congratulating Jennifer Van Pelt - Words Alive Volunteer of the Month for July 2018! Jennifer has been a lead writer for the Words Alive Blog since February. Her ability to research and create content around relevant topics is a tremendous asset to our communication team and our organization. Her efforts continue to boost our blog views and highlight Words Alive as a leader in transforming lives through literacy. We are so appreciative of the nearly 100 hours she has given in writing time so far! And, we are thankful she shares her talent with our organization. I am a San Diego Native and attended SDSU for a Business Management Degree, emphasis in Human Resources. I enjoy talking to and helping people and also volunteer to teach English Second Language -- nothing is more rewarding to me than seeing others succeed. When and how did you first get involved with Words alive? My passion for helping people is what attracted me to Words Alive. I love that we give our participants the tools to achieve their goals and inspire those around them to do the same. What is the most rewarding part of your volunteer role(s)? The most rewarding part of volunteering with Words Alive is being able to witness all of the good that Words Alive does -- our success stories, photos, and events speak volumes for the organization and the impact we have on others. I am excited to see how Words Alive grows! I have been reading the Song of Achilles by Madeline Miller, inspired by my recent trip to Greece! This article is part of a series in which we highlight and celebrate stories from our volunteers, and explore what it means to volunteer at Words Alive. Read Part 1 here. Our volunteers and donors at Words Alive enable us to serve over 5,000 students and families every year, and we would truly be unable to work towards our goal of inspiring a commitment to reading throughout San Diego County without all of their support. These volunteers are not only able to connect with students and exceed expectations when teaching in the classroom, but they are also passionate about the difference they make in student’s lives! They eagerly come back week after week because they enjoy working with children and they are able to see the inspiration they incite and change they make in the future of the children and their families. Read below for some first hand stories as to why our volunteers love being a part of our Words Alive family! 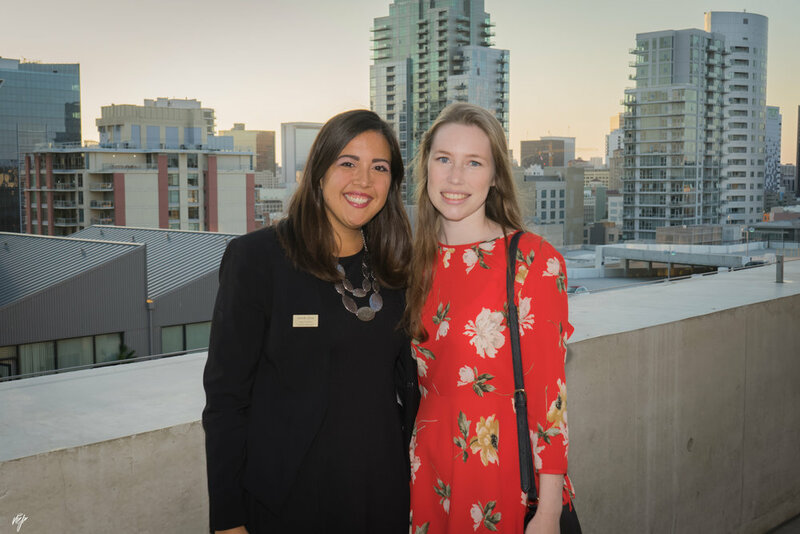 An image of Katherine Finley, Office and Teen Services Intern, with Jessica Fryman, Teen Services Program Manager, at the 2017 Words Alive Westreich Scholarship Ceremony. An image of Karen Malin, Read Aloud Program and Event Committee Volunteer, accepting an award at Councilmember Lorie Zapf's Volunteer Appreciation Day. These are just a few stories about the rewarding and inspiring experiences that our volunteers are able to enjoy every week with our students and families. As an organization with over 550 volunteers, there are countless more experiences to be shared by existing volunteers and even more to come from future volunteers! Whether you are a book-lover or enjoy teaching others, there are several different ways to bring your passion into the classroom. To get involved in supporting our mission of improving literacy in San Diego, visit our page here to review the opportunities and create a story of your own! Please join us in congratulating Sonya Williams - Words Alive Volunteer of the Month for May 2018! Sonya has been with our volunteer family since December. She has already made such an impact on her Adolescent Book Group students and teachers at South Bay Blended Tech in National City. Sonya’s charisma is unparalleled, which makes her a dynamic facilitator. She has a knack for commanding attention from her group of raucous teens while keeping the session fun and engaging. She makes it a point to provide one on one attention, connecting with individual students throughout each creative writing session. Sonya has also contributed to the program by writing curriculum guides. And, she has started to help facilitate volunteer orientations – sharing her classroom experiences and tips with new volunteers. Her support is well-rounded and given with such positivity and energy. Sonya, we are so lucky to work with you! Thanks for giving us your time. I have always loved reading. As a young child, I was always sneaking off to read a book (and I still do). My love of reading took me to England for my master’s degree in English Literature, inspired me to start several book clubs, teach college, ESL and literacy classes, run an educational center, write curriculum, and develop training programs and e-learning courses. These days, I also spend a lot of time reading Mo Willems books with my kids. I initially got involved with Words Alive to develop curriculum, but was convinced to teach an ABG writing class, and I’m glad I did. It’s so rewarding to develop real connections with individual students, and to see a powerful, personal piece of writing come from a student who doesn’t speak in class. And it’s inspiring to work with the classroom teachers who invest their lives in these students. I’m currently reading Sing, Unburied, Sing by Jesmyn Ward. Please join us in congratulating Mercedes Santiago - Words Alive Volunteer of the Month for April 2018! Mercedes has been a Words Alive Volunteer for over two years. She is a devoted reader who brings consistency and positive energy to each of her Read Aloud Program sessions. Mercedes is also one of the first to respond to fill in for a fellow reader. She has volunteered for the organization's annual fundraiser, the Author's Luncheon as well. We rely so much on commitment and follow through, and Mercedes exemplifies those traits in a volunteer. Thanks, Mercedes, for your commitment and enthusiasm! My name is Mercedes Santiago and I retired after 38 years of being a school counselor for San Diego Unified School District. I'm very grateful that I had such a wonderful career supporting teachers, administrators, parents and those amazing students. Just as my career was fulfilling my retirement is equally as rich. I enjoy new experiences, salsa dancing, the arts, yoga, meditating and volunteering. Life is too good to sit back and not participate! How did you get involved with Words Alive? I must thank my friends, Charlene Sapien and Estela Salazar, who introduced me to Words Alive. Reading has been the perfect vehicle to be part of student's lives. Seeing the children smiling so happy when you enter the classroom is just as thrilling and exciting for me as it is to them. I really like to spend time listening to the student's understanding of the message and how it relates to them. I like to expound upon self-respect and tolerance whenever the book bridges these topics. I truly look forward to our time together. I love having a book in my hand and presently I'm enjoying Howard Cutler M.D. & His Holiness the Dalai Lama, The Art of Happiness. Cutler writes that Dali tells you that happiness is the purpose of life and that every motion of our life is towards happiness. How to get there has always been the question. For me, it's service to others that truly makes me happy. Thank you all for bringing joy to children. Please join us in congratulating Meghan Scripture - Words Alive Volunteer of the Month for March 2018! Meghan is a passionate and energetic addition to our volunteer family. She joined the Teen Services Program this past fall as a book group facilitator at Monarch. Since then, she has flourished in the classroom with her group of students. Meghan livens up the discussion by facilitating cooperative learning opportunities to encourage student participation. Her volunteer teammates often sing her praises, recognizing engaging ideas she brings to the classroom and the support she brings to the team. In addition to her classroom support, she has helped spread the word about our programs and even recruited more volunteer support from her current employer, GoFundMe. Meghan is a joy to work with and we feel lucky to have her in our program. Thanks for the work you do for our community! As a former military brat, I found that having my nose in a book was a way to bring comfort and familiarity to each new city and home. I majored in English because I simply couldn't imagine what else I could possibly be as interesting as reading and writing. Graduation and a job in sales had me itching for more, so at 26, I found myself in South Korea working as an ESL teacher. Two years later, my thirst for living abroad still wasn't quenched, so I joined the Peace Corps and was blessed to be placed in a remote Fula village in The Gambia- a tiny country known as the "Smiling Coast of Africa." Upon my return, I made my home in San Diego and am loving life on this very different, but equally amazing coast working for GoFundMe, a company I believe in. One of the best parts of Peace Corps for me was meeting one my best friends, Jess Fryman, who introduced me to Words Alive after moving out to San Diego and finding a job that she was truly passionate about. I've become a huge fan of Words Alive and all the opportunities it brings to so many kids in the greater San Diego area. I'd say the most rewarding part of my volunteer experience so far has been the little moments. We've had a couple of sessions where the kids are excited about the topic that they just keep talking. It's also been a pleasant surprise to see that regardless of the topic, these young minds are mature and introspective in ways I just didn't expect. I feel at times they are teaching *me* a thing or two! I'm currently reading Born a Crime by Trevor Noah. Apartheid is such a heavy topic, but he makes it so digestible with his impeccable comedic timing and wit. Please join us in congratulating Karen Archer - Words Alive Volunteer of the Month for February 2018! Karen is a newer member of the Words Alive volunteer team, and in her first program year with us has helped pilot our Read Aloud Afterschool Program in Oceanside! Karen has been a real superstar in this important expansion to Oceanside. She has always remained positive and committed as we have found our way with a new initiative, delivering in an after-school site, and delivering a new curriculum for 4th and 5th graders. I could not have wished for a more flexible and passionate volunteer, who clearly shares in our mission to bring a real love of reading to our young readers. Karen is also an avid participant in the organization’s volunteer events. She makes an effort to attend each monthly Cookies and Conversation hour, contributing to great discussion. We are very appreciative of the huge commitment in the classroom she honors each week, and we enjoy working with Karen. Thank, Karen! I’ve been married for almost 38 years. My husband, Bob, and I have two boys and six grandchildren. Unfortunately, half are in Connecticut and the other half are in Italy. We moved from Connecticut to Carlsbad in 2003. It only took one winter to fall in love with Southern California. I retired from my Family Law Paralegal position in June of 2016. Then waited for Bob to retire from Pfizer in April 2017. When I’m not reading to the “wigglers,” as we refer to the children in the Read Aloud Program, I read on my own, do counted cross stitch and “clean” cook. (I stay away from any processed foods, so I make my own vegetable broth, mayo, ketchup, BBQ sauce, ice cream, etc.) Bob is a member of the Carlsbad Senior Volunteer Police. We started our own business, Archer Woodcraft, so on weekends we sell household items such as hardwood cutting boards, wine caddies, tissue boxes, and custom furniture at the College of the Desert Street Fair. We are busier than ever doing all the things we love. I never managed to make the time to volunteer while I was working. One of my "after retirement" goals was to find a way to help my community by doing something I’m passionate about. I found the Words Alive posting on Volunteer Match and couldn’t wait to start. To be able to help young children find the joys of reading is perfect. I absolutely love to watch the emotions roll across these young children's faces as a story unfolds. They can’t wait to find out what book I’m going to read. When I begin, they sit back, relax and come along for the adventure. I recently finished reading Daughters of the Night Sky by Aimie K. Runyan and am currently reading The Invention of Wings by Sue Monk Kidd. Both are wonderful reads. Please join us in congratulating Stacy Magic - Words Alive Volunteer of the Month for January 2018! Stacy has been part of the Words Alive family since 2011 – volunteering in multiple capacities and roles. She has represented the organization at outreach events, supported the execution of the Author’s Luncheon and Fundraiser, and worked directly with students both in the classroom as a book group facilitator and as a scholarship student mentor. This year, Stacy helped Words Alive open a new site for Adolescent Book Group (ABG). While facing challenges and growing pains that come with something new, she not only showed up week after week but excelled as a facilitator. Stacy has a knack for prioritizing student responses, prodding students along and encouraging engagement, which often means waiting out those tough silent moments rather than allowing the adults to take up all the space. Last semester, she even gave students the opportunity to be facilitators themselves. Relinquishing control to give students the floor leaves the session open to many uncertainties, which, as we all know, can be a bit scary! Nevertheless, Stacy gave students that chance, always encouraging them along the way, and as a result - students gained confidence and showed leadership in impressive ways. We’re so grateful for Stacy’s long-term support of the students and the Words Alive mission. Thank you for devoting years and hundreds of hours of service to the community! My name is Stacy Magic. I’ve volunteered time since college, primarily with organizations that promote reading: The Braille Institute, Rolling Readers, READ San Diego, and Words Alive. I grew up in Los Angeles, in a home with lots of books. I heard about Words Alive while on the board of directors at San Diego Writers, Ink, an organization which provides classes in writing, author readings and signings, and other literary events. I was drawn to the mission Words Alive has created for itself, which, in my interpretation, is to share the joy and importance of reading to as many people as possible. The most rewarding part of volunteering at Words Alive is, in the immediate, getting to see teens get excited about a book, and, in the long term, about their future. I’m listening to A Clash of Kings in the car. I have The Golem and the Jinni on my Nook. And, on my nightstand, I have Y is for Yesterday, Sue Grafton’s final A thru Z book. I’ve read A thru X and love Ms. Grafton’s character, Kinsey Millhone. That’s what I like to share: you meet the coolest people in books. Please join us in congratulating April Hayter de Lopez - Words Alive Volunteer of the Month for November! April started with Words Alive in 2012 as a reader in our Read Aloud Program. She then transitioned to the Adolescent Book Group (ABG) program. 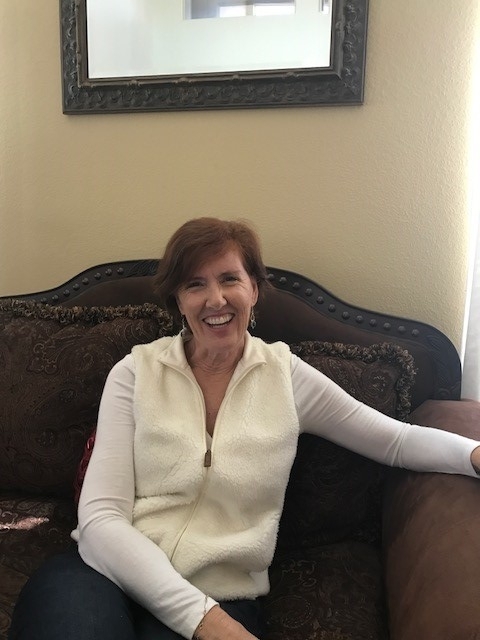 For the past three years, April has successfully volunteered in North county sites to facilitate the book group, and has led both volunteer teams and students to have an amazing experience with the program! April is the lead volunteer at Innovations Academy of Empowerment, where the book group meets every other week. She is a positive and motivating force who keeps her volunteer team and their sessions on track. She is always open to trying new ideas to increase student engagement. Thanks for all you do to make our program successful! My name is April Hayter de Lopez. I am starting my third year at Words Alive. I love to read and have been in a book group for many years. In fact, members of my book group are the ones who got me interested in Words Alive. I really love to be with kids, so when my own went off to college, Words Alive gave me the perfect opportunity to continue to connect with teens. I work with the elderly as a social worker, so I feel privileged to work with people on both ends of the age spectrum. The most rewarding part of volunteering for me is when I'm talking with a teen and feel a spark, an interest between us, as we discuss books and life. I am excited when someone who doesn't particularly like reading gets hooked into a story and wants to read ahead. When a teen can relate to the story or to a character from their own life, it is wonderful. I am currently reading An Unquiet Mind by Kay Jamison, and Feed by M T Anderson.